Although things never really exploded, soccer matches between East Germany and West Germany were always something special for both teams. Teams from both countries met each other mostly in European or Intertoto Cup, friendlies were often forbidden between 1945 and 1990. I try not to give to much attention to all the political turmoil surrounding these games, but focus on the events on the soccer pitch. After the Second World War, Germany wasn’t allowed to compete internationally for a while. West Germany played their first match after the war against Switzerland, on November 22, 1950, winning 1-0. East Germany made their debut on the international stage two years later. On September 21, 1952 they lost 3-0 to Poland in Warsaw. In 1954, West Germany surprisingly beat Hungary to be crowned World Champion in Switzerland. In East Germany, people were also very excited about this. That showed two years later, when a club from West Germany played a friendly match in East Germany for the very first time. 1.FC Kaiserslautern travelled to Leipzig to play champion SC Wismut Karl-Marx-Stadt on October 6, 1956. The Red Devils, with five ‘World Champions’ in their team, won 5-3. Captain Fritz Walter made a stunning goal with his back heel, while diving forward. No less than 120,000 soccer fans were delighted to see such a great team from West Germany, with no hostility at all. The friendliness surrounding this match sadly was an exception. As all the commotion regarding the Olympic Games proved. The IOC didn’t want two German soccer teams at the Olympics. They preferred one, if possible, combined team. As East-Germany declined in 1956, a West German team could compete that year in Melbourne at the Olympics. Unsuccessfully, as they lost 2-1 against the Soviet Union and were immediately out of the tournament. Four years later, both countries wanted to participate in Rome. Negotiations were fruitless, until the IOC ordered both countries to pick dates and venues for two matches in 1959, to determine who eventually could go to Rome. The West German Soccer Association was afraid for who knows what, and insisted both matches be played behind closed doors. The first was in East Berlin, which West Germany surprisingly won 2-0. There was an own goal by Dieter Fischer and a goal by Gert “Charley” Dörfel, who later had a brilliant career at Hamburger SV. The return saw West Germany winning again, 2-1 in Düsseldorf. This time the goals were scored by Joachim Thimm, Heinz Wilkening and DDR-player Günter Schröter. It was totally unexpected, as East Germany was allowed to use full internationals, while West Germany had to line up amateurs without any international experience. 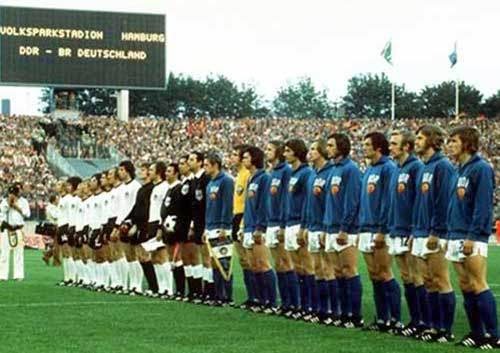 In the end, West Germany didn’t make it to Rome as they were clearly beaten by Poland during the regular qualification. Still, it was slightly eerie, knowing that young men, who shared the same nationality until 1945, now played each other in two matches without having any contact whatsoever between them around those games. It was forbidden as their counties were enemies now. Four years later, September 1963, the same procedure was held for the Olympic Games in Tokyo, luckily this time the matches were open for spectators. East Germany were the far better team in the match in Karl-Marx-Stadt (3-0), West Germany’s response, a 2-1 victory in Hannover, was to not enough. From 1968 onwards both Germany’s were allowed to qualify for the Olympics. In 1972 they met again at the Olympic tournament in Munich. 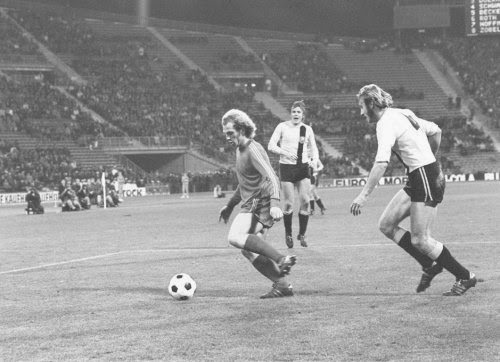 Host West Germany met East Germany in the second round, with both teams having a chance to qualify for the final. West Germany had a strong but young team with several players, like Heiner Baltes, waiting to sign a professional contract so they could compete at the Olympics. Still, the likes of Bernd Nickel (Eintracht Frankfurt), Ottmar Hitzfeld (FC Basel) and 20-year old star player Uli Hoeness weren’t strong enough to win this match. It ended 3-2 to East Germany, with goals from Jürgen Pommerenke, Joachim Streich and Eberhard Vogel for East Germany, and Hoeness and Hitzfeld for West Germany. Two years later, the stakes were even higher at the World Cup 1974 in West Germany, East Germany was drawn into the same group as the hosts. It would be the first and last time the two would play a match at top level. On Saturday, June 22, they met at the Volkspark Stadium in Hamburg. Both teams had already qualified for the Second Round, there was only prestige at stake. First Jürgen Grabowski (West) and Hans-Jürgen Kreische (East) both missed a very big chance from a short distance, Gerd Müller hit the post. 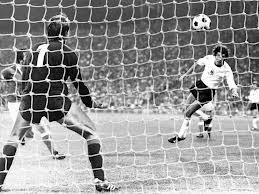 Overall West Germany was the slightly better team, but East Germany won the match 1-0 thanks to a goal by Jürgen Sparwasser in the 77th minute. Hell broke loose in West Germany, after a rather disappointing first round. Bernd Cullmann lost his place in the starting eleven, Bernd Hölzenbein replaced him. But it also changed the attitude of the West Germans. They had to step up a little, and they did so in the next four games. Losing against East Germany might even have been a blessing in disguise for West Germany. Qualified as number two from the group, West Germany avoided playing the Netherlands, the superior team in the first round, and world champion Brazil. Meanwhile, East Germany was very pleased with their win. During the seventies, East Germany had a golden soccer generation, and winning against enemy West Germany was almost as important as winning the Olympic gold medal in 1976. After the match in Hamburg, both teams never met again. They were drawn together for the qualification for the European Championship in 1992, but those matches were never played, because the Wall came down. On club level, East and West met each other all the time. In the European Cups, and even more often in the Intertoto Cup. Although there was some prejudice and hostility from both sides during most of those matches. Both countries always emphasized the differences between the two countries, never the common ground they of course still had. Of these 19 double meetings, nine were won by East Germany, eight by West Germany with no winner on two occasions. A great result for East Germany of course, who probably were also more eager to do well in these matches, as a win would give them a lot of prestige in their own country. For most clubs from West Germany, they were meaningful preparation matches for the Bundesliga season at the most. While the Intertoto Cup matches hardly had value to West German teams, the European Cup of course is a whole different story. In 1973, Bayern Munich and Dynamo Dresden were the first two teams to meet, Bayern being the favorite. At home they won 4-3 win, after trailing 0-1 and 2-3. So it promised to be an close match in Dresden two weeks later. Lots of East German soccer fans were very excited thinking of the visit of Bayern Munich to Dresden and went to the hotel to catch a glimpse of the stars. But Bayern wasn’t there. They were afraid something would go wrong in East Germany, perhaps with the food, or with Dresden fans making noise during the night in front of the hotel. So they decided to travel to Dresden by bus on the match day, which was very rare and against UEFA relugations. Anyway, after 58 minutes in another close game (0-2 by two Uli Hoeness-goals, then 3-2 and an advantage on away goals for Dresden), Gerd Müller scored the all decisive equalizer: 3-3 and Bayern were through to the next round. Still, not all was well between the two countries. Although everybody agreed to play European matches against each other, there still was a lot of animosity. After beating Dynamo Dresden, Bayern Munich was unstoppable and won the European Champions Cup in 1974, while 1.FC Magdeburg took the European Cup Winners Cup the same year. This meant they should meet to play for the European Super Cup, home and away. But somehow the two clubs couldn’t find dates for those matches and they were never played. Of course, this had everything to do with the cold war between the two Germanies, they didn’t want to play each other. It was also not done to arrange friendly matches between clubs. It was even prohibited from 1961 (the building of the Wall) onwards, until by 1975 tension had eased and 1.FC Kaiserslautern got the kick-off with a match at home against Carl Zeiss Jena, losing 0-1. East Germany officially didn’t call these matches friendlies - as West Germany still was very much the enemy - but Internationaler Fussball-Vergleich (something like International Football Comparison Game). In total, only three wins for East German clubs in seventeen attempts. 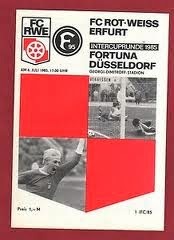 Their best performance was without a doubt the double victory against Schalke 04 by 1.FC Magdeburg in 1977. Again with Jürgen Sparwasser as the hero. At home he scored three goals in the 4-2 victory. Away in Gelsenkirchen (1-3) Jürgen Pommerenke was the star player with two goals. The two most exciting clashes were both won by West German teams. 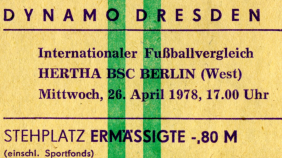 In the spring of 1986 Dynamo Dresden met Bayer Uerdingen for the quarter finals of the European Cup Winners Cup. The home match was won by Dynamo, 2-0. A good result to travel to Krefeld. It promised to be a close game, if Bayer Uerdingen would score an early goal. They didn’t. In fact at half time Dynamo Dresden was leading 3-1, and 5-1 on aggregate. During the break, Uerdingen coach Karl-Heinz Feldkamp asks his team to try ending their European adventure with their heads helt high, not to make it any worse. And Uerdingen did show character. They attacked relentlessly and pulled two goals back in the 58th and 63th minute, 3-3. With only 27 minutes left, they still had to score three goals. But surprisingly, they did. Uerdingen was on a roll, and Dresden just tried to hold on, but were incapable of doing so. “It was pure fear”, coach Klaus Sammer said after the game. And the miracle happened. Wolfgang Schäfer scored 4-3 in the 65th minute, Dietmar Klinger made it 5-3 thirteen minutes later. Another minute later Uerdingen got a penalty, which Wolfgang Funkel put behind goalie Jens Ramme, who’d replaced the injured number one, Bernd Jakubowski, after halftime, but acted very nervously. The match was won, and Schäfer made another goal to make it 7-3. To make things even worse, Dynamo attacker Frank Lippmann ‘escaped’ from the underground garage into the city centre of Krefeld, to start a new life in West Germany. Two years later, the difference in standard of life between West and East Germany was influential in the European confrontation between Dynamo Berlin and Werder Bremen. Dynamo Berlin trashed Werder Bremen 3-0 in their home match, presuming nothing could go wrong in Bremen. But Werder Bremen officials had a trick in mind to make the Dynamo players thinking even less about the game. They organized some kind of auction at the hotel on Tuesday, the day before the match. The players could buy western consumer goods if they wanted: televisions, vcr’s, hairdryers and stereos. And they eagerly did. To finalize the deals, they had to come back to the hotel lobby on Wednesday afternoon, very close to the start of the game. So with their minds on the goods they just bought and carried to their bus, combined with the arrogance that a 3-0 lead was more than enough to go through to the next round, the Dynamo Berlin-players walked on the pitch.To be beaten by a highly motivated Werder Bremen squad, 5-0.